Roman snails (Helix) are a part of the helicid snail family (Helicidae). Those snails, making the largest terrestrial snails in Central Europe, are distributed in the Western Palaearctic, which means they are found in all of Europe as far east as the beginning of Asia. The American counterpart are several families from the Helicoidea superfamily distributed throughout America. Helicid snails are not among them - those Helicidae appearing in America, among them Helix pomatia, Cornu aspersum, Theba pisana and Cepaea nemoralis, exclusively have been introduced by man. Turkish snail (Helix lucorum). Picture: [RN]. The area with the largest number of species is Southern Europe and the Mediterranean. But also in Central Europe there is a large number of helicid snail. The central European Roman snail (Helix pomatia) may be the only species actually native to Central Europe, but in the meantime other species have been introduced, such as the brown garden snail (Cornu aspersum) and the Turkish snail (Helix lucorum). Those for example can be found in the south of Vienna, the brown garden snail also in Schleswig-Holstein in northern Germany, and everywhere else where those Mediterranean and oceanic species can survive the winter. Also counted among the helicid snails are the banded snails (genus Cepaea), the copse snails (Arianta arbustorum), the lapidary snail (Helicigona lapicida) and their relatives. Helix pomatia, Cornu aspersum and Helix lucorum by no means are the only species of Helix kind snails known to science. To the east as well as to the south-east and the south, there are distribution areas of other Helix species and their nearest relatives, adjacent to that of Helix pomatia and sometimes overlapping with it. Some of those, like the Corsican snail (Tyrrhenaria ceratina) and the Sicily snail (Cornu mazzullii) only are found in a very limited area. 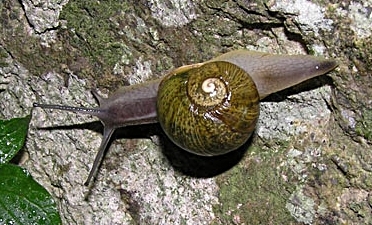 Others, like the Podolic snail (Helix lutescens) have a more far-stretched distribution areas, adjacent to the east of Helix pomatia distribution. Especially those snail species with a limited distribution usually are more or less threatened in their existence, especially where they are collected by the native population for food. As well Tyrrhenaria ceratina, as Cornu mazzullii have been placed on their respective home countries' red lists with a different degree of urgency. Picture: Gerhard Falkner, Musée de l'Histoire Naturelle. 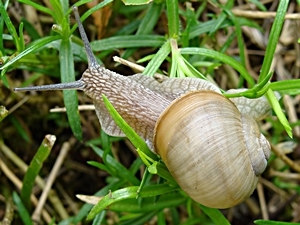 Description: The Corsican snail distantly resembles a brown garden snail (Cornu aspersum). Both have a globular shell with dark bands, the navel (umbilicus) of which is hidden. 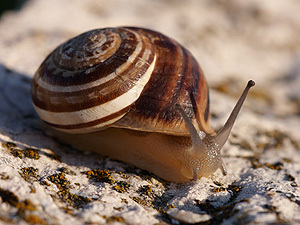 The Corsican snail, is much smaller, though and does not possess such a prominent aperture lip. It is due to its shell's brownish colour that this snail has the species name ceratina. Specially to be mentioned is the very much widened foot sole of the Corsican snail, an adaptation to the unstable sandy underground it usually crawls on. Dimensions: W: 25 mm. (Abbreviations). Appearance of Tyrrhenaria ceratina (red) and Cornu mazzullii (orange). Source: Physical Map of Italy, equirectangular projection. 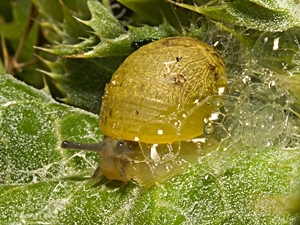 Habitat and Distribution: The Corsican snail's habitat is found in the upper reaches of the beach, under vegetation of Salzmann's gorse plants (Genista salzmanni) and different other plant species. Leaves and flowers of Salzmann's gorse are also among the snails preferred food. Additionally it lives on mosses, lichens and on organic compounds which it gains by eating sand. Tyrrhenaria ceratina prefers loose ground with heath vegetation, where it can easily dig into the soil. Areas devoid of vegetation due to human influence, as well as hard compressed ground with ruderal vegetation, the Corsican snail avoids. The species is nocturnal, it only comes out during the day, when it is raining. During dry periods it aestivates hidden underground, sometimes as deep as 60 cm. Discovered in 1843, Tyrrhenaria ceratina has spread out only very little since then. It is estimated that the species appears only in an area of about 6 ha. on the south-western coast of Corsica, near Campo dell'Oro. There are archaeological hints towards the Corsican snail distributed over a wider part of Corsica in historic times (4500 to 9000 years ago): Shells have been found near Bastia and Bonifacio, slightly different from recent shells, but nevertheless assigned to the same species. From the Neolithic there are fossils proving that at that time Tyrrhenaria ceratina was spread much wider in Corsica. It is unknown, if the reduction of the species' distribution area is due to climatic influence or human interference, as like many Helix relatives, Tyrrhenaria ceratina at times was collected by the native population for food. Threat Situation: Because of its very small area of distribution and the large extent of threat to its habitat by changes caused by man, Tyrrhenaria ceratina has been classified as critically endangered (CR) on the red list of France (see also: IUCN Threat Categories). Bouchet, P. 1996. Tyrrhenaria ceratina. In: IUCN 2010. IUCN Red List of Threatened Species. Version 2010.4. <www.iucnredlist.org>. (Stand 16. November 2010). Gargominy, O.; Bouchet, P. & Ripken, T. E. J. (1999). Tyrrhenaria ceratina. In Muséum national d'Histoire naturelle (Ed.) (2004). Inventaire national du Patrimoine naturel. Bouchet, P.; Ripken, T. & Recorbet, B.: Conservation of a narrow-range mediterranean island endemic, Helix ceratina from Corsica, Journal of Conchology, Special Publication 2, 1998, p. 205 - 208. Picture: Tato Grasso, Source: Wikipedia. Description: On the first sight, the Sicilian snail resembles a common Roman snail, also from its size. But its brownish yellow shell is strongly striated, almost ribbed. The fast increasing whorls are outweighed by the apertural whorl, which, at the aperture, descends strongly. The aperture is large and almost horizontal. Its interior is white. The aperture rim on the parietal side ends in a glossy and smooth whitish layer. The navel (umbilicus) is invisible. Dimensions: H: 30 - 40 mm; W: 28 - 35 mm; N: 3 - 4. (Abbreviations). mazzullii at Monte Cofano in Sicily. 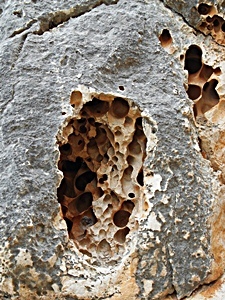 Habitat and Distribution: The Sicilian snail lives on and near calcareous rocks. It dissolves rock matter using a yellowish green acidic slime from its foot gland, to gain lime to build its shell. Supported by its radula, the snail also drills tunnels in the stone to hide from predators, as well as dryness and heat. With time and by the action of several snails, the rock may well look like a Swiss cheese. In the tunnels, Cornu mazzullii had drilled, also other snails will hide. 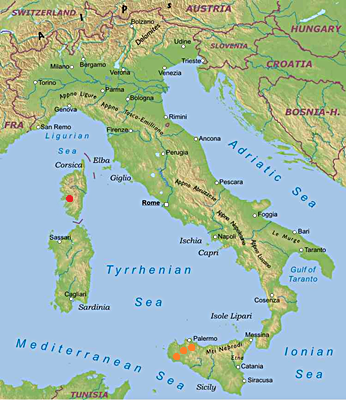 The distribution area of the Sicilian snail consists of several disjunct areas in north-western Sicily, near the coast between Trapani and Cefalù. Threat Situation: In the years gone, the populations of the species are in a slight decline. This may be because of their use to man as food, but also due to destruction of habitats because of human urban expansion. Nowadays, stable population mainly occur in the nature reserves of Monte Cofano, Capo Gallo and Monte Pellegrino. 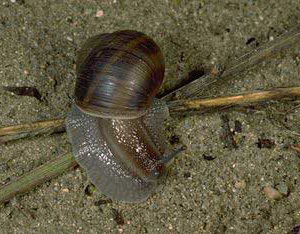 The Sicilian snail has been placed as near threatened (NT) on the Italian red list (see also: IUCN Threat Categories). Excursione Malacologica nel Trapanese auf naturamediterraneo.it. Manganelli, G. 2000. Cornu mazzullii. In: IUCN 2010. IUCN Red List of Threatened Species. Version 2010.4. <www.iucnredlist.org>. (Stand: 16. 11. 2010). Guiseppe Ippolito und Silvia Bello: Il Monte Cofano e le sue chiocciole. Francisco Welter-Schultes: Helix mazzullii species homepage. Podolic snail (Helix lutescens). Source: Wikipedia. Description: The Podolic snail is the eastern neighbour of the central European Roman snail. It is, though, much smaller, with a globular shell and a quite low spire (e. g. compared to Cornu mazzullii). The shell's walls are thin and on their surface there are fine spiral lines, which near the suture may form a grid pattern with the transverse stripes. The shell is brownish yellow until yellowish white and may either be unbanded or have pale, usually narrow, bands (picture). The rim of the slightly oblique aperture is little thickened, the apertural lip is whitish to reddish. The navel (umbilicus) disappears beneath the columellar part of the lip and often is completely closed. The snail itself is of a greyish colour with two distinct lighter stripes alongside its flanks. Dimensions: H: 27 - 33 mm; W: 24 - 31 mm. (Abbreviations). Habitat and Distribution: The Podolic snail lives on meadows, in grassland and in bushes, on dry and sunny slopes in lower altitudes. Often, it appears in gardens and cemeteries. Helix lutescens is mainly nocturnal, coming out between afternoon and morning. It is most active in the early morning hours, depending on humidity, temperature and precipitation. The species distribution area covers the Carpathians and the neighbouring regions, in the west to Krakow, eastern Slovakia and eastern Hungary, in the north to Brest, in the south to northern Serbia and Walachia. In the east, Helix lutescens appears as far as the Ukraine, west of Kiev, as well as in the north of Rumania and in Transylvania. Note: Podolia (Russ. Подолье - Podolye) is a historic area in south-western Ukraine and in north-eastern Moldavia (the northern part of Transnistria) and constitutes the eastern part of the species' distribution area. Threat Situation: In Poland, the Podolic snail is slightly threatened. That is, on the one hand, because the species appears there at the rim of its area of distribution and so the populations are only regional and isolated. On the other, the Podolic snail appears in Poland mainly in habitats formed by man, which is why it is strongly influenced by changes in those habitats. Finally, Helix lutescens is often mistaken for Helix pomatia and collected for food or commerce. So Helic lutescens is placed on the Polish red list and classified as near threatened (NT) (see also: IUCN Threat Categories). Francisco Welter-Schultes: Helix lutescens species homepage. Grunting snail (Cantareus apertus). Picture: Clemens M. Brandstetter, Buers. Description: The species name of this snail is due to its elate shell, the last whorls of which strongly outweighs the others. The vernacular name, as well as the genus name ("singing snail") is due to this snail's grunting and foaming, when it is disturbed. The grunting snail's shell has a much thinner wall, than Helix pomatia or Cornu aspersum. It is quite shiny, yellowish brown until olive green (hence also the name "green snail"), without any stripes or spots. The aperture rim is hardly thickened, there is no aperture lip. At its parietal side, the aperture shows a whitish layer, a co-called callus (picture). Identification by shell characters: Cantareus apertus. The snail itself is coloured light grey, with a darker back. A bluish white "eel back stripe" goes along the snail's back. 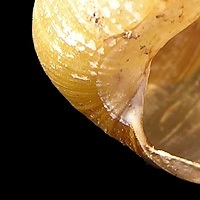 In a living snail, the foot, in relation to the shell, is very large. Dimensions: H, W: 22 - 28 mm. Habitat and Distribution: The grunting snail lives in Mediterranean shrubs (macchia), field woods and vineyards. Picture: Sarah Gregg, Source: Con altri occhi. Cantareus apertus is found in southern France, west of the Rhône estuary, in Liguria, Tuscany and southern Italy, as well as in central Greece, on Cyprus and at the African coast of the Mediterranean. Besides, the species is at home on several Greek islands, in the Tyrrhenian, Ionian and Aegean Sea. 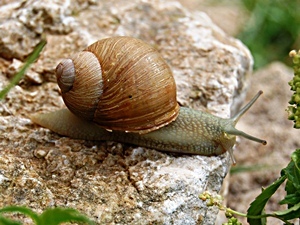 In the dry regions of the Mediterranean, the grunting snail builds a calcareous shell lid, but not to hibernate, as does Helix pomatia, but to aestivate, which the snail does dug deeply into the ground. On Crete, it is only active three or four weeks after the beginning of the rain season in October. 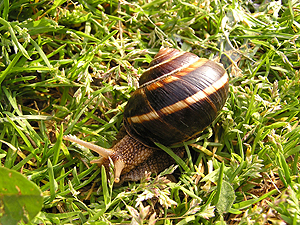 Grunting snails are often introduced into central and western Europe with food and vegetable transports from the Mediterranean. In nature, however, they usually will not survive winter, which is why there are very few stable populations of introduced Cantareus apertus outside of the species' actual distribution area. In southern France, the grunting snail is collected as a delicacy, and so has become locally rare, so as a consequence the snail may only be collected for personal purposes. Often, Cantareus apertus is also raised on snail farms, e. g. in Italy. Francisco Welter-Schultes: Helix aperta species homepage.